X-Men: Grand Design #2 Review – AiPT! The second chapter reveals Sentinels and more of the Phoenix! 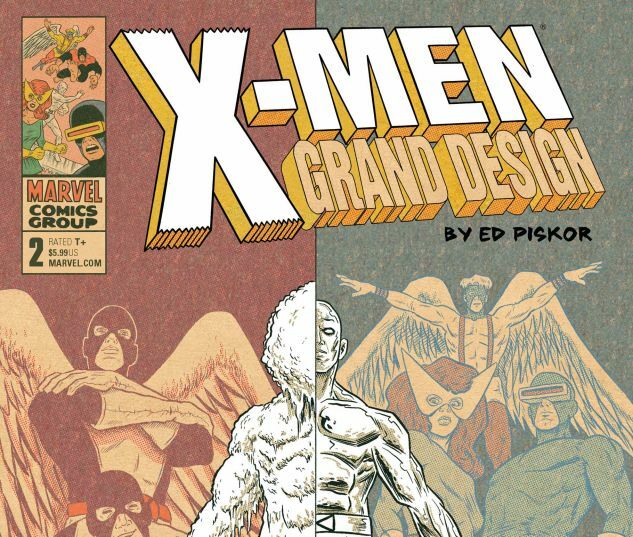 Ed Piskor dazzled me with the first issue of Grand Design and that was only two short weeks ago. He’s back with issue two — which is also the final issue — and it takes readers on a historical journey of the X-Men right up through the beginning of the Phoenix drama. The summary above says it all, as Piskor is going to take us on another journey through X-Men history, slightly changing things so that it all jells wonderfully. It may not be exactly as it happened, but the way Piskor brings so many storylines together is a thing of beauty. Villains are more of a focus this issue as things get a little convoluted and a lot more focused on Phoenix. While the first issue focused exclusively on the rise of mutants and more specifically on Cyclops and Jean Grey’s story, this issue is a bit more broad in its approach. For much of the work, Piskor uses the X-Men as a team more than any one character, though some of the team members get a chance to shine here or there. This issue dances around more obscure (at least for me) storylines and uses characters I wasn’t familiar with, like Mesmero. That makes it more informative and filling in gaps that I never knew existed. It’s also fun to see how Xavier is a great manipulator of his X-Men and also a character you probably shouldn’t trust. He’s never a villain, but when he goes missing you have to wonder where his head is at. The art continues to be super indie and tight. The smallest of panels shows a lot of love and care from Piskor, delivering huge story beats. Focuses on more obscure characters. This book ends with a promise for more in late 2018, which is a relief because the story doesn’t advance as far as one might think. Wolverine for instance never shows up. The first issue played a lot of the hits while this issue focuses on many lesser known and less interesting stories. That left me wishing for a more interesting narrative. This issue also never really has a character arc to speak of either, which is a failure when compared to the first issue. There’s no single character to tether yourself to and instead, the story floats on talking about the X-Men as a vague group of heroes (who fail a lot). One could argue Magneto is a central character, but he goes missing for a big portion of the book. In a big picture view, this issue begins to bring in more of the alien influences on the series and thus gets very weird and convoluted. I wanted to love this second chapter, but unfortunately, it doesn’t do a lot of what the first issue excelled at. It doesn’t play the hits, there are no strong character arcs to follow, and it meanders into some less interesting and obscure stories. That said, die hard X-Men fans will eat this up. The art continues to be excellent and the story weaves in so much, but a lot of it is so obscure and strange it's hard to get excited.